Including DVD to iPod Converter, iPod Video Converter and iPod Rip, Xilisoft iPod Mate is a 3-in-1 pack application made especially for you iPod. It realizes everything that you want for iPod such as rip DVD movies and put them into your iPod, convert popular video/audio files to iPod supported files as well as transfer music/movies/photos compatible with iPod between iPod, computer and iTunes. 1.Support all iPod types (iPod, iPod nano, iPod classic, iPod shuffle, iPod Mini, iPod touch and even the new iPod nano 5) and iPhone 4. Work well with iOS4.0, iPhone/iPod touch Firmware 3.2.2 and iTune 10 as well. 2.Import photos from your computer to iPod and vice versa. Classify photos by creating/renaming/deleting photo albums and share one photo with multiple albums easily. 3.Search through your files in a jiffy by using the Filter or Quick Search function. 4.Information about your iPod such as type, capacity, version, serial number and format will be shown on the main interface. 5.View your photos, movies and music on thumbnails mode or list mode. 6.Create and edit playlists according to your mood. 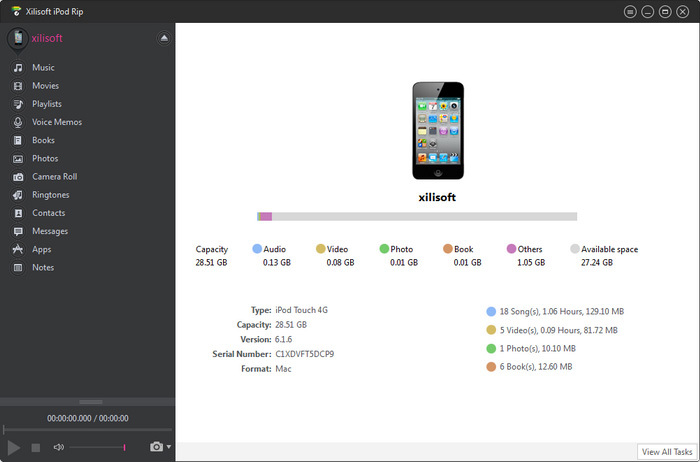 7.Manage several iPods at a time without affecting each other's files, copy music just by the drag-and-drop feature. 8.Play iPod movies and music in the built-in resizable player with 4:3 or 16:9 aspect ratio. 9.Pick out a scene you want to convert by setting the start time and duration. Split one file into several parts by preset size or time to make large files fit with iPod/iPhone. 10.Compute the file size before you convert with the built-in Bit Rate Calculator. 11.Convert audios and videos in batches, even set different output formats for each. 12.Support dual-core and multi-core CPU usage to maximize ripping and converting speed. 13.Additional features include running the application at background, presetting one post-task action, choosing the needed language interface to your preference, and etc. Xilisoft 3GP Video Converter 6.6.0.0623 - Convert AVI to 3GP, MPEG to 3GP (WMV, MOV, DV, VOB, ASF, etc.) and vice versa. Xilisoft Audio Converter 6.3.0.0805 - Audio extractor and converter between MP3, WMA, WAV, AAC, FLAC, OGG, APE formats. Xilisoft Audio Maker 6.3.0.0805 - All-in-one tool for your audio collection: converter, ripper and burner. Xilisoft AVI to DVD Converter 6.2.1.0321 - Fast and user-friendly AVI to DVD converter with burning and editing features. Xilisoft DivX to DVD Converter 6.2.1.0321 - Convert DivX/XviD video files to DVD movie disc, DVD folder or ISO file. Xilisoft DVD Audio Ripper 5.0.62.0305 - Handy tool to extract audio from DVD & convert it to MP3/AAC/M4A/OGG/RA/WAV/WMA. Xilisoft DVD Creator 7.1.3.20131111 - Create and burn DVDs from 3GP, AVI, DAT, DV, FLV, MP4, MKV, MPG, MPEG, WMV, etc. Xilisoft DVD to AppleTV Converter Mac 6.5.1.0322 - It can rip DVD to Apple TV video MP4 to put DVDs on video iPod for Mac users. Xilisoft DVD to MP4 Converter 5.0.62.0416 - DVD to MP4 converter: rip your DVDs to the MP4 or DivX format easily! Xilisoft iPod Rip 5.3.1.20120606 - iPod rip and copy software which perfectly connects iPod, iPhone, PC. Xilisoft iPod Video Converter for Mac 7.7.3.20140221 - It can convert video formats to iPod video and audio files to iPod MP3 for Mac. Xilisoft MOV Converter 6.6.0.0623 - Convert MOV to AVI, MPEG, WMV, DivX, extract audio from MOV to MP3, WMA, AAC. Xilisoft MP3 CD Burner 6.3.0.0805 - Create Audio, MP3 or WMA CDs from almost any video and audio files. Xilisoft MP3 WAV Converter 6.3.0.0805 - Convert to MP3/WAV, extract audio from video, split, edit tags, add effects. Xilisoft MP4 Converter for Mac 6.0.7.0707 - Convert videos to MP4 with MAC to play on iPhone, iPod, PSP, PS3, Archos, etc. Xilisoft MPEG to DVD Converter 6.2.1.0321 - MPEG to DVD converter to burn MPEG video files to DVD movie. Xilisoft WMA MP3 Converter 6.3.0.0805 - Convert music from many popular audio formats to MP3 or WMA. Split, add effects.